The image above is just a mockup, but rumor has it that Google will finally bring SMS/MMS support to Hangouts in version 1.3. 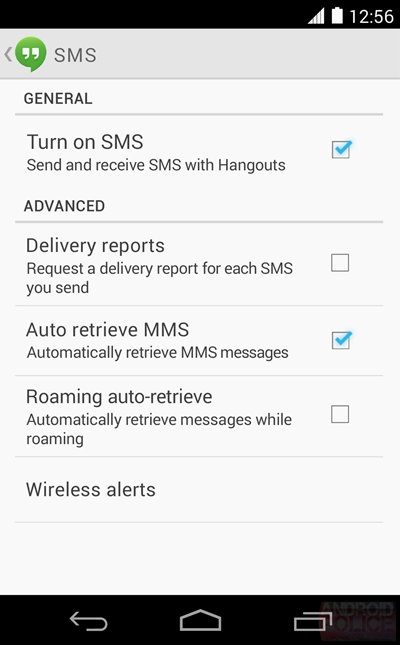 According to sources who sent images to Android Police, once integrated and the option turned on, users will see a “via SMS” notation to show how the message in Hangouts was sent. There may even be the option to send videos. The current version of Hangouts is 1.2.018. There is no definitive confirmation at this time that 1.3 will introduce SMS and MMS or when we’ll see it, but Google told us shortly after the introduction of Hangouts that it would be the future of Google Voice. Adding in the oft-requested integration of text and picture messaging would help complete that promise. Actually, it one-ups Voice since Voice has lacked MMS support on everything outside of Sprint phones. It also helps turn Hangouts into a 1-stop shop for messaging. It certainly seems like the time is right, especially with Android 4.4 “Kit Kat” around the corner. With that said, I wouldn’t be surprised if Google held off on announcing SMS integration until they unveil Kit Kat and the new Nexus phone. Then again, if it’s ready, why wait? I know that many of you have been waiting impatiently for this feature to arrive. Now that it appears to be close, how excited are you?